(Bloomberg Opinion) -- President Donald Trump’s proposed budget for 2020 is a fairly standard list of conservative priorities. Trump would spend more on the military and border security and cut funding for health care, including Medicare and Medicaid, as well as welfare programs such as food stamps. The problem with Trump’s budget isn’t the deficits that it would create. These would be substantial — more than $1 trillion a year, or at least 5 percent of gross domestic product. But economists generally agree that the U.S. government can handle more debt than it now has without risking higher interest rates or inflation. Instead, the problem is the budget’s misplaced priorities: It cuts spending on effective and important programs, while spending more on things the U.S. has in abundance. Trump’s budget slows the growth of Medicare benefits. Some of these measures are budgetary tricks that shift Medicare spending to other parts of the budget — perhaps designed to make Trump look tough on entitlements. Others are cost-control measures envisioned by the Barack Obama administration. But there are also some real cuts in the amount of health-care seniors receive, which would require the elderly to pay more out of pocket or receive less care. The budget also cuts Social Security benefits, especially the Social Security Disability Insurance program, as well as discretionary health spending. But the most dramatic changes would be to Medicaid, which gives health benefits to 75 million lower-income Americans. Under the Affordable Care Act — commonly known as Obamacare — Medicaid was expanded. Trump would reverse that. He also would require Medicaid recipients to work in order to receive the benefits, a change that some states are already moving to implement. More importantly, Trump’s budget would transform the Medicaid system into a block-grant program, in which states would receive fixed amounts of money from the federal government to spend on Medicaid. This might let state governments that don’t like the idea of Medicaid spend less on the program, as often happened when President Bill Clinton’s welfare reform transformed cash assistance into a block-grant program. This comes at a time when the U.S. is experiencing an unprecedented opioid epidemic, with highly addictive, deadly drugs like heroin and fentanyl ravaging large swathes of the population, killing tens of thousands a year and leaving many more unable to work. Medicaid is one of the government’s most important programs for combating this epidemic, since it increases addicts’ access to treatment. Counties that voted for Trump in 2016 tend to have high opioid usage rates, meaning Trump’s budget would disproportionately harm his own voters. Taken together, Trump’s health-care changes would greatly reduce government spending on the most vulnerable Americans — those who are sick, poor, elderly or disabled. Combined with Trump’s big tax cuts for business in late 2017, it paints a picture of a plutocratic government intent on raiding federal coffers to feather the nests of the already wealthy. Meanwhile, Trump would increase spending on the military, which already consumes about 4 percent of GDP. He would also spend billions on his southern border wall. Those tax cuts and spending increases also make it impossible for Trump to use the federal budget deficit as an excuse for his funding cuts. If Trump were actually concerned about government borrowing, he wouldn’t have slashed revenue by lowering taxes. In fact, Trump’s budget would represent an increase in the deficit from about $779 billion in 2018 to more than $1 trillion a year. Although these deficits probably won’t be large enough to damage the economy, they make it clear that Trump is no fiscal hawk, and is cutting health spending purely because he thinks sick, disabled, poor and elderly people don’t deserve the money. Penalizing these Americans is unlikely to be popular. Republicans in Congress will probably insist that the spending cuts be watered down. But ultimately, that may not prevent the American public from getting the message that their health care is far from secure. Watching Trump try to erode Medicaid and Medicare, the many millions of people who depend partially or completely on those programs will realize that the government could take away their benefits at any time. Yet that may increase support for a more consistent system of government health care than the current haphazard and costly patchwork. Already, a majority of Americans supports the idea of a single national health-insurance system. 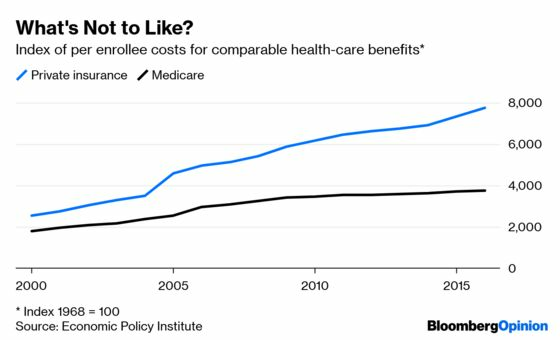 The most popular plan is to simply let Americans of all ages use the existing Medicare system while keeping private insurance coverage in place. The more Trump chips away at people’s health benefits, the closer the day when demands for universal health care become overwhelming.